Canadian Silver Maple Leafs are known to be the most pure of all the world-minted silver bullion coins at .9999 fine silver. Weighing exactly one ounce of pure silver, these silver bullion coins are extremely popular worldwide and track the price of silver each day on the world market. 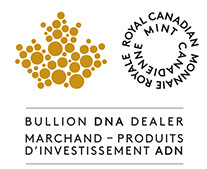 Recently the craftsmen at the Canadian Mint have added anti-counterfeiting measures like radial lines and a micro-engraved Maple Leaf hologram.